Roasted garlic. So easy. So simple. So delicious! The first time I enjoyed roasted garlic was when my husband and I were dining in Omaha’s Old Market. We ordered an antipasto appetizer off the menu at Vivace, which came with an assortment of cheeses, salty Italian meats, crusty bread and roasted garlic. Neither one of us had had roasted garlic before, and we were in love after the first bite. Don’t live near Omaha? 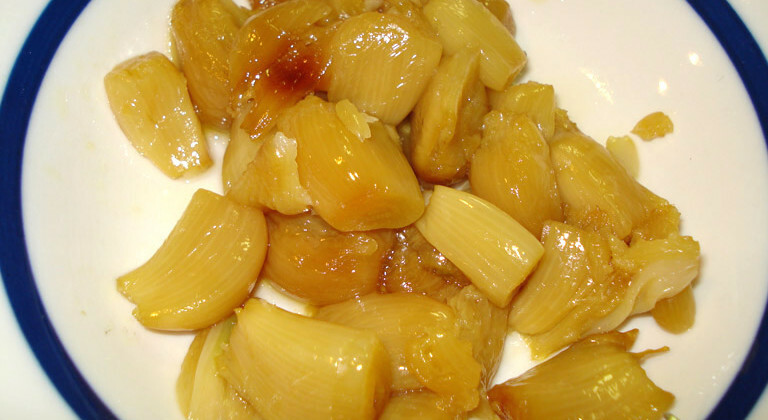 That’s all right, you can enjoy roasted garlic in your home, without a lot of fuss. What comes out of the oven is the most delicious way to enjoy garlic. Squeeze out the golden brown cloves, mash into a paste, and enjoy. I love roasted garlic smeared on a piece of crust bread. Yum! Yum! Yum! Cut the tops off the garlic, drizzle olive oil over the garlic, wrap up in tin foil and roast in a hot oven (400-425 degrees F) for 45-60 minutes.